A 23-year-old male has relapsed Hodgkin's lymphoma Stage IV receiving an immune checkpoint inhibitor (ICI) therapy (nivolumab). After 3 months of treatment, the patient developed watery diarrhea and cramping pain.18 Fluorine-fluorodeoxyglucose positron emission tomography-computed tomography (18 F-FDG PET-CT) is performed for restaging.18 F-FDG PET-CT images showed bowel wall thickening and colonic distension with corresponding increased tracer uptake [Figure 1]. Although compare to prior study, there is complete metabolic resolution of prior hypermetabolic lesions are noted. 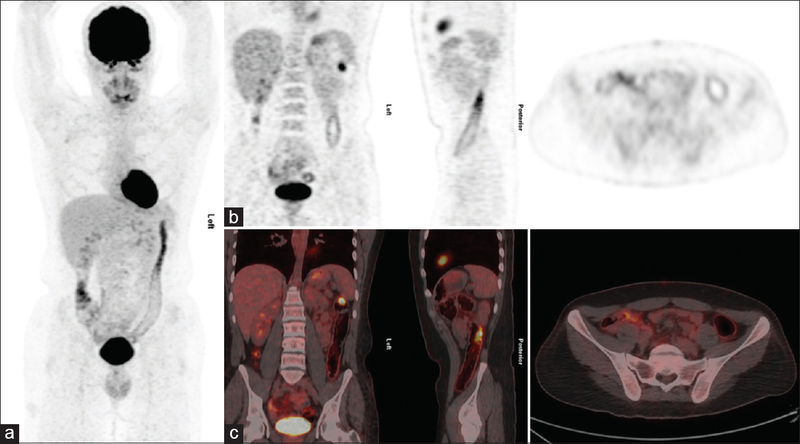 Baseline and follow-up scans after nivolumab therapy are shown in [Figure 2]. In the current study, the findings in the bowel are likely related to side effects of immunotherapy inducing secondary enterocolitis. Other causes like drug (e.g., metformin)-induced nonspecific uptake in the bowel is excluded. Nivolumab is an ICI, is a humanized anti-programmed death-1 (PD-1) monoclonal antibody that is used as second-line therapy in various types of cancer such as melanoma, non-small cell lung cancer, renal cancer, Hodgkin's lymphoma, urothelial cancer, and head and neck cancers., Recently, nivolumab has demonstrated high (64%–87%) response rates in relapsed or refractory Hodgkin's lymphoma. Nivolumab may activate T cells to develop antitumor effects, but this immune activation sometimes causes immune-related adverse events, such as pneumonitis, hepatitis, and enterocolitis. Sometimes, these adverse events are serious and life-threatening, which require timely patient management and adequate therapeutic decisions. ICIs, nivolumab is associated with many immune-regulated adverse events including nausea, abdominal pain, and diarrhea. Diarrhea is observed in about one-third of patients. It usually occurs in the 3rd month of therapy. Diarrhea may be infectious or autoimmunological. About 8%–22% of patients receiving immunotherapy develop autoimmunological enterocolitis. Clinical symptoms of enterocolitis include mixed watery and bloody diarrhea and cramping pain. Enterocolitis can be managed with cessation of nivolumab and administration of intravenous corticosteroid therapy or infliximab therapy in severe cases, like in our case. 18F-FDG PET-CT is standard of care for the staging, monitoring of response to therapy, and detection of disease recurrence for Hodgkin's disease and non-Hodgkin's lymphomas., 18F-FDG PET-CT can be used to identify regions of active inflammation in ulcerative colitis. ICI is a potentially important therapeutic agent for refractory and relapsed Hodgkin's lymphomas. As the use of ICIs in cancer therapy increases, therefore immune-related adverse events are frequently identified on 18 F-FDG PET-CT, which may lead to early diagnosis, close clinical follow-up, and appropriate clinical management of immune-related adverse events. Guo L, Zhang H, Chen B. Nivolumab as programmed death-1 (PD-1) inhibitor for targeted immunotherapy in tumor. J Cancer 2017;8:410-6. Ansell SM, Lesokhin AM, Borrello I, Halwani A, Scott EC, Gutierrez M, et al. PD-1 blockade with nivolumab in relapsed or refractory Hodgkin's lymphoma. N Engl J Med 2015;372:311-9. Friedman CF, Proverbs-Singh TA, Postow MA. Treatment of the immune-related adverse effects of immune checkpoint inhibitors: A review. JAMA Oncol 2016;2:1346-53. Gonzalez RS, Salaria SN, Bohannon CD, Huber AR, Feely MM, Shi C, et al. PD-1 inhibitor gastroenterocolitis: Case series and appraisal of 'immunomodulatory gastroenterocolitis'. Histopathology 2017;70:558-67. Kim KW, Ramaiya NH, Krajewski KM, Shinagare AB, Howard SA, Jagannathan JP, et al. Ipilimumab-associated colitis: CT findings. AJR Am J Roentgenol 2013;200:W468-74. Pagès C, Gornet JM, Monsel G, Allez M, Bertheau P, Bagot M, et al. Ipilimumab-induced acute severe colitis treated by infliximab. Melanoma Res 2013;23:227-30. Jerusalem G, Hustinx R, Beguin Y, Fillet G. Evaluation of therapy for lymphoma. Semin Nucl Med 2005;35:186-96. Buchmann I, Moog F, Schirrmeister H, Reske SN. Positron emission tomography for detection and staging of malignant lymphoma. Recent Results Cancer Res 2000;156:78-89. Das CJ, Makharia GK, Kumar R, Kumar R, Tiwari RP, Sharma R, et al. PET/CT colonography: A novel non-invasive technique for assessment of extent and activity of ulcerative colitis. Eur J Nucl Med Mol Imaging 2010;37:714-21. Herbaux C, Gauthier J, Brice P, Drumez E, Ysebaert L, Doyen H, et al. Efficacy and tolerability of nivolumab after allogeneic transplantation for relapsed Hodgkin lymphoma. Blood 2017;129:2471-8.